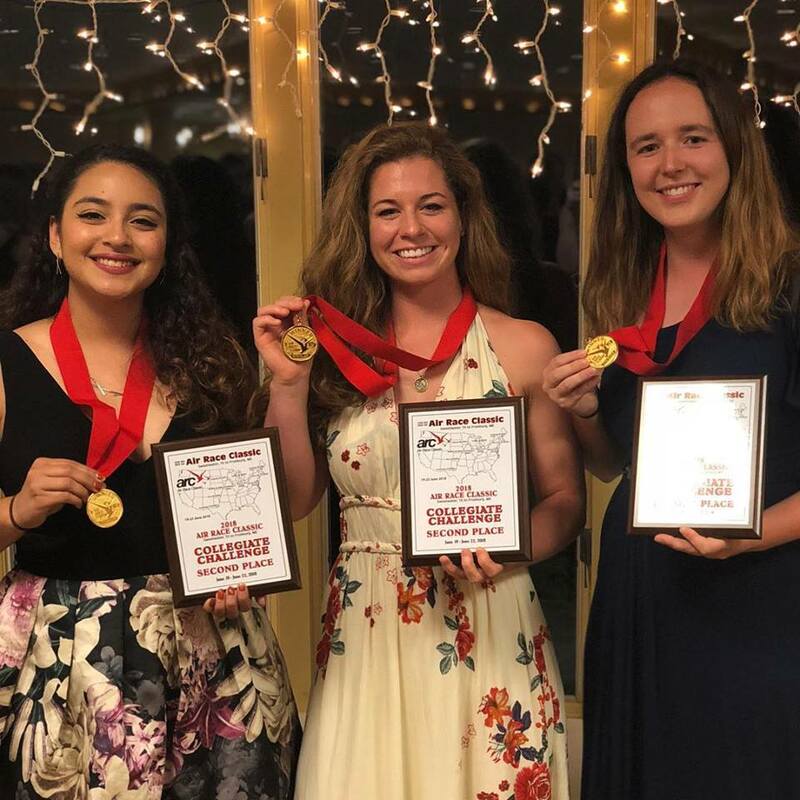 In June 2018, the Lady Buckeyes competed in the Air Race Classic starting in Sweetwater, TX and ending Fryeburg, ME. The Lady Buckeyes, made up of Ohio State students Yasmine Abu-Arab, Josie Cotugno, and Aly Bond, placed in 7th place overall amongst approximately 60 teams, and in 2nd place amongst just the collegiate teams! 2018 Lady Buckeyes (Left to right: Yasmine Abu-Arab, Josie Cotugno, Aly Bond)The contestants were given four days, flying VFR in daylight hours, to reach the terminus. Each airplane is assigned a handicap speed – and the goal is to have the actual ground speed be as far over the handicap speed as possible. The pilots are thus given the leeway to “play the elements”. Holding out for better weather, winds, etc., the objective is to fly the "perfect" cross-country. 2018 Air Race Classic Route MapDuring the flight the Lady Buckeyes encountered poor weather conditions on Day one of the race and were delayed in Nebraska for most of the day. That did not deter their commitment to finish the race, and when the weather cleared on Day two they made it to Indiana. Day three proved to be a long one, but the team was able to fly all of their remaining legs and ended the day in Maine. Despite the poor weather the team ended up completing the race in just three days, and without any penalties or point deductions by race officails. Leading up to the race the Lady Buckeyes worked hard to secure sponsorship and recieved finacial support from The Ohio State University College of Engineering, the Ohio State Center for Aviation Studies, Ohio State Aviation Alumni Society, Captial City Aviation, Envoy Airlines, PSA Airlines, Lane Aviation, as well as numerous personal donations.